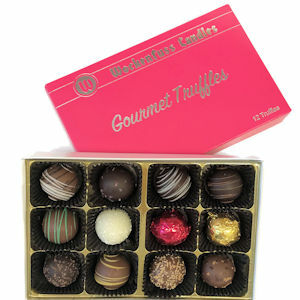 Our bite-size gourmet truffles have a rich and smooth dark chocolate ganache center, protected with a delicious chocolate outer shell. Assortment may include: Dark Amaretto, White Rum, Milk Caramel, Milk Irish Cream, Milk and Dark Chocolate, Dark Coffee, Milk Hazelnut, Dark Raspberry, Milk Tiramisu, Milk Coconut and Dark Sea Salt Caramel. Sugar, Cocoa Mass, Cocoa Butter, Heavy Cream, Corn Syrup, Soy Lecithin (an emulsifier), Natural and Artificial Flavors, Vanilla Extract, Butter, Coconut, Contains 0.5% or less of the followingz: Invertase, Natural Potassium Sorbate (preservative), Hydrogenated Coconut Oil, Partially Hydrogenated Palm Kernel, Cottonseed Oils, Propylene Glycol, Glyceryl Lacto Esters of Fatty Acids, Mono and Diglycerides- as emulsifiers, Dextrose, Salt, Coffee, Spices, Color (FD&C Red 3, Yellow 5, Yellow 6, Blue 1), TBHQ (preservative) and Citric Acid - to preserve freshness. May contain Milk, Peanuts, Tree Nuts, Soybeans and/or Eggs.